Friends! New colours! They’ve been here for a month now, and I’m only just getting to play with them. FINALLY, right? This one is with Coastal Cabana, which I adore. This card is a very CASED one that I got from Bada-Bing! Paper Crafting! I swapped out the yellow for some beautiful Strawberry Slush, and the Pear Pizzaz for Basic Gray. I’m in love with this colour combo. Hearts all around. And isn’t that white doily stuff cool? It’s a tape! You just snip it to the length you want, and stick it on. Easy peasy. Oh, about my little life.. An update on the broken wrist! It’s feeling pretty darn good, although I have very little rotation ability. I’m working hard at it, and it seems to be very slowly improving, so that’s a good sign. I’ve been back playing ultimate for a month or two. I started out trying to play left-handed, but quickly forgot about that and have been able to play with the right size. And since I’ve started my workout program, I’ve had so much more energy and have been able to run FAST! (at least fast for me). I’d always felt like the slow girl, so this is a big step up! It’s really given me confidence again. Back to the card… Pretty colours? Yes.. Maybe I should bedeck my house in the colours… get some paint colour-matched. What do you think? Add some of that doily trim here and there.. no? Too much? Darn! Notice the really subtle flowers on the bottom left? I stamped those in Versamark. Love that effect! Versamark, Coastal Cabana and Strawberry Slush Inks. Delicate Details Lace Tape, Basic Gray Stitched Grosgrain Ribbon, and Whisper White Baker’s Twine. 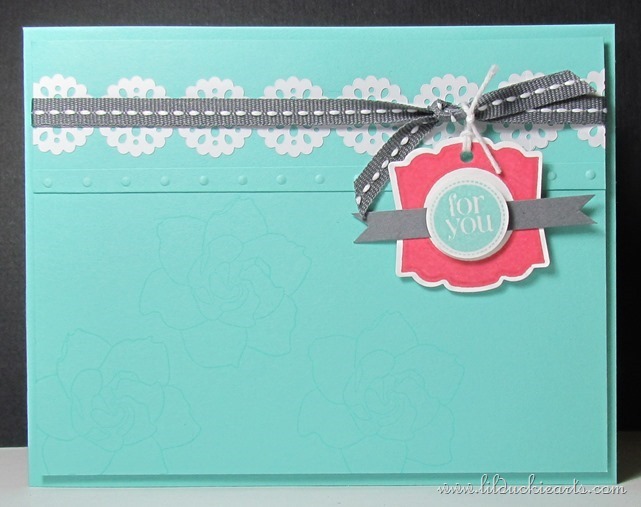 Big Shot and Perfect Polka Dots Embossing Folder. 3/4” Circle Punch, and Artisan Label Punch. 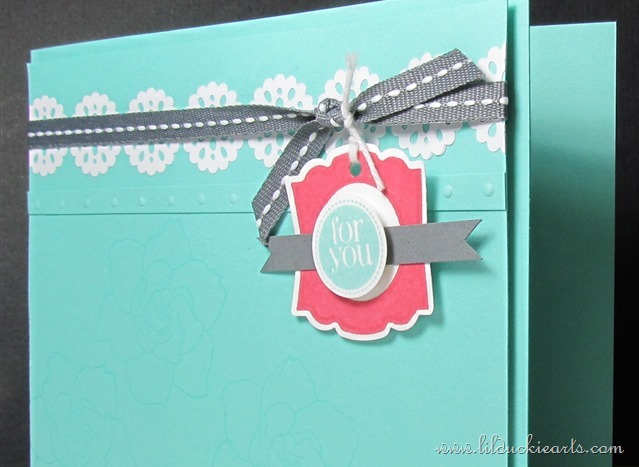 This entry was posted in Any Occasion, baby, birthday, card, Thinking of you and tagged any occasion, baby, birthday, card, celebration. Bookmark the permalink.